Forget the state fair. Skip that hunting trip. Don't bother watching the Mayweather-McGregor fight. 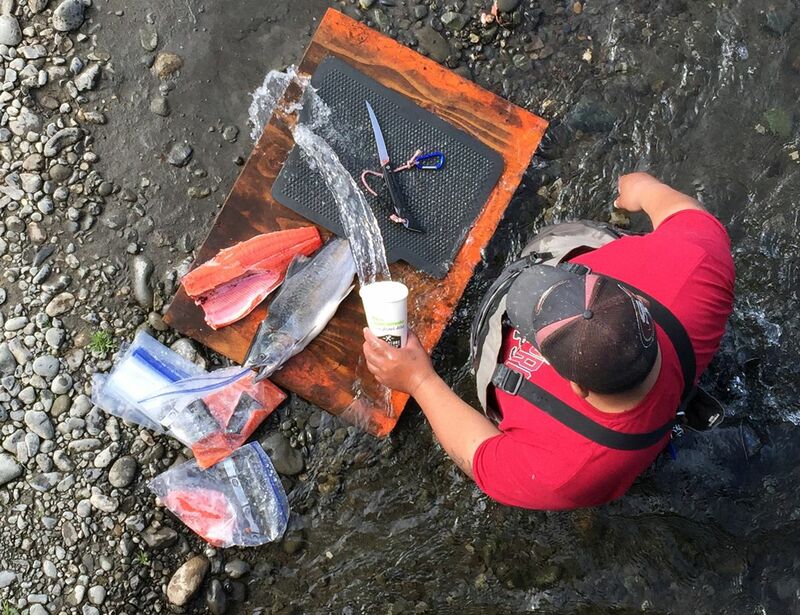 Alaska Department of Fish and Game biologists are suggesting Southcentral anglers instead pack their freezers with silver salmon fillets this weekend, and they've relaxed several regulations to allow that. On Friday, biologists boosted the bag limit on Anchorage's Ship Creek to six silvers, confident they've already got enough of a brood stock for the nearby William Jack Hernandez Sport Fish Hatchery. "With each tide, there are still plenty of nice-looking coho coming into Ship Creek, and since it looks like we are going to meet our hatchery and natural spawning needs, let's go fishing," said Brittany Blain-Roth, the assistant area manager for Fish and Game. She noted that the last time something similar happened was 2014, when the limit was five coho. Despite good silver fishing, Blain-Roth said only about a dozen anglers were fishing when she visited Ship Creek earlier this week. "But half of them had fish on," she noted. "Got to flip a coin this time of year — go hunting or silver fishing." Ship Creek's relaxed bag limit follows similar actions in the Mat-Su, where the limits on the Deshka River, Wasilla Creek and Cottonwood Creek were doubled and the Little Susitna River, where anglers were permitted to use bait. "Coho salmon are now widely distributed throughout the Susitna drainage and fishing is very good in all locations of Susitna and Yentna," said Fish and Game's weekend fishing report for the Mat-Su area. "This is the weekend to target coho before the run starts to tail off and fish begin to turn color as they mature for spawning." Despite the end of the Seward Silver Salmon Derby, Resurrection Bay anglers continue to score with "boat anglers having great success trolling near Caines Head and along the beach in front of town," according to the Fish and Game weekly fishing report. "When a large school is found, anglers will switch from trolling to mooching gear to produce quick limits. Small to medium herring with a hoochie squid has been the ticket." In addition, shore-based anglers casting spoons or pieces of herring beneath a bobber have scored from Lowell Point beaches, the mouth of Falls Creek and from shore near the Alaska Sealife Center. Fish and Game has also reported "excellent" silver fishing on the Kenai River, where "anglers are achieving bag limits. All indications are that coho are late this year." Red salmon remain available in the Russian River for anglers who prefer sockeyes.